Note : Classification by central pressure was ended in the 1990s, and wind speed alone is now used. Surge values are no longer referenced in this scale. The actual storm surge experienced will depend on offshore bathymetery and onshore terrain and construction. A minor modification was made to the limits of Categories 3, 4, and 5 on May 15, 2012 to resolve rounding errors. 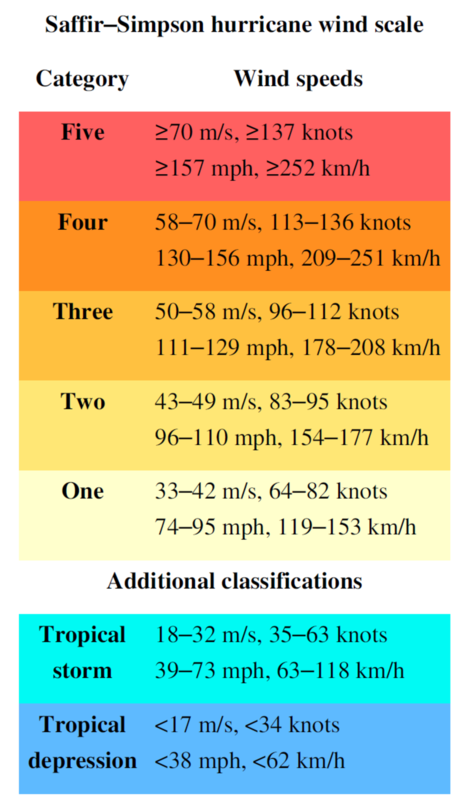 The Saffir–Simpson hurricane wind scale (SSHWS), or the Saffir–Simpson hurricane scale (SSHS) for short, classifies hurricanes – Western Hemisphere tropical cyclones that exceed the intensities of tropical depressions and tropical storms – into five categories distinguished by the intensities of their sustained winds. To be classified as a hurricane, a tropical cyclone must have maximum sustained winds of at least 74 mph (33 m/s; 64 kn; 119 km/h) (Category 1). The highest classification in the scale, Category 5, is reserved for storms with winds exceeding 156 mph (70 m/s; 136 kn; 251 km/h). There is some criticism of the SSHS for not taking rain, storm speed, and other important factors into consideration, but SSHS defenders say that part of the goal of SSHS is to be straightforward and simple to understand.